Our fishery has come alive as warmer water temperatures usher in the summer seasonal species. The possibilities are endless as sharks, ladyfish and bluefish are added to the mix. With so many different kinds of fish available, anglers will have a great time on the water most any day. Redfish are hungrily chasing artificial lures. Jerk shad lures paired with flutter hooks are my go to option. These lures, usually 4″-5″ in length, imitate the small baitfish that have flooded our waters. Flutter hooks have a weight on their shank that let you cast a far distance and also put motion on the lure. I use flutter hooks in size 3/0 with a 1/8oz. weight. Make sure to cast to the edges of the schools, if you cast right into the middle you stand a good chance of spooking them. The trout bite has really improved over the last few weeks. Popping corks remain the way to go. I prefer mud minnows as bait as they are hardier than shrimp and less likely to get decimated by bait fish. When fishing in deeper waters, we’ve been using leaders as long as five or six feet. It can make casting a bit awkward but gets the bait right on the fish’s nose. Sharks are becoming increasingly more active. Try fishing along ledges where there is a sudden drop in depth. Often these predators will sit right along these areas. Bonnetheads have been hitting blue crab while Sharpnose have favored strips of bluefish. One of the advantages of fishing with bluefish is that you’ll occasionally hook into massive bull redfish. Flyfishing for reds has been most productive at low tide when sight fishing conditions are optimal. Flies with lots of flash are working well, especially the copperhead pattern. 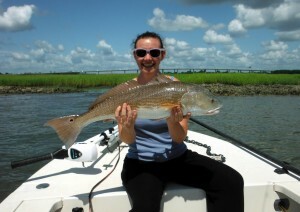 During the big high tides in the evening, we have been able to get up into the grass and cast to tailing redfish. A good weed guard on your fly can really help. The Dupree’s spoon fly is a perfect choice for this setting.